marks what would have been the 100th birthday of the greatest drummer who ever lived. This post’s intention is take you back and reflect upon this great man. And perhaps for those that are younger, create some awareness of this extraordinary and influential musician… I didn’t want this Thursday to be an afterthought… I wanted to write something because I always felt connected to Krupa’s music through my father’s admiration of him. Last spring I wrote an article called Gene Krupa:The King of Cool. It was very special to me, as I so fondly recall my early youth when my father seemed to play Krupa’s LP’s daily… One of the comments from that article mentions how Krupa achieved “Supreme Greatness.” Tough to dispute! Just ask any knowledgeable drummer alive today and there will be very little argument… Clicking the above link will take you to that article. I will never claim to be an expert on any genre of music. I’m just a guy who is deeply moved and inspired by music in general. But for me the music of Gene Krupa is where my love of music truly began. In fact it was the first beat I probably ever heard; as my father would swaddle me and swing back and forth to the rhythm of the music. Today I find Krupa’s music nurturing to both my heart and soul… Even though my father and Gene Krupa are no longer with us, the era and musical spirit will forever live deep inside my fondest memories of being a kid. My dad knew him. Played with him too…! Looooong ago…He instilled in me a love of music. Another drummer of that era, down on his luck, showed up at our house in Pomapno~60’s. Dad set him, and his teenage drummer son, in the other side o’ my grannie’s duplex. Got em BOTH a gig at one of the Beach lounges….gd, what was his name??? Duffy, I think. Krupa/Rich style drummer! Krupa, I think they are lacquer, even before vinyl. I too am thinking of the spirit of Gene today. A beautiful and sweet man from all accounts, and a rock star ahead of his time. I got lost at the World’s Fair in 1964 and accidentally walked in on Gene alone working out on his drums in what was an unfinished exhibit at the fair. I was too scared to bother him ( my great regret) But he took a little bow over his drums and kept on playing. Gene was my favorite drummer along with Elvin Jones, Buddy Rich, Art Blakey, and Keith Moon. I am a Japanese of 32 years old. I live in Japan. I do not understand the English. I use the translation site and write this. Therefore a sentence may be wrong. I love a swing drummers. It is Gene Krupa, Dave Tough in particular. I heard a record of Benny Goodman Carnegie Hall Jazz Concert at the age of a junior high student. Thereafter Gene Krupa is my idol. When I watched Benny Goodman Story, I imitated Gene Krupa with chopsticks（laugh） I want to go to U.S.A. someday. And I want to watch Carnegie Hall. This was and to a great extent still is the man that ALL drummers are measured against. His persistence to be more than a mere time keeper may have turned lots of producers off, but he was right and he knew it. I became a drummer because of people like Gene and Buddy Rich. What I saw and heard them do was absolutely mind blowing and I am the drummer I am today because of their influence. …. thanks for re-sharing this post from last year…. it’s as great as any of your reflections/memories you have come to share with all of us here !! Thanks for being here with your “Reflective Jazz & Blues Blog Reviews”…. a one man show as you put it…. I saw the poll about guest reviewers…. I stand in the “Uncertain” line !! You as a “solo act” make “magic happen” each week…. with your own special touch and reflections…. I wouldn’t want to see that magic minimalized by someone else coming into your space…. but I am sure you would be very careful about any “guest post” here in your own domain !! 🙂 Thank you Blues Blogger for everything you do here !! Gene Krupa came in Japan in 1952. He did having a thing recorded in Japanese Victor. “The Moon Over The Ruined Castle” and “Badgers Party” are Japanese old songs. He asked a supervisor before taping “Badgers Party”. However, he said with “iti, nii “in Japanese not English when recording started. He had learned those Japanese by a Japanese drummer beforehand. The Japanese drummer respected him very much. During his stay, the Japanese drummer served him as a band man. When he left Japan, he presented his drums to the Japanese drummer. Amazing artist. I wonder, do we have anyone comparable today? the level of musicianship and endurance seem to be beyond today’s musicians. Is it a lost art, or are our physical bodies no longer capable of such expertise? Had no idea that he developed our current standard for drum sets. Probably responsible for much more, since recording standards would have had to be changed to accommodate him. Thanks for posting and for giving more insight, through reflections into your life, into the effect music plays on all of us. I am happy I knew Krupa the last 18 years of his life. Gene was such a warm wonderful human being, and great performer. Chills would run threw me every time I would see him perform live. It’s sad he is no longer with us, but his memory is, thanks to guys like you. Thank you so much Blues Blogger for yet another inspiring, well-researched, fantastic blog! How fascinating that Gene Krupa was the first to record w/ a bass drum and to introduce drum solos – two of my favorite things! I grew up with a drummer for a brother, who practiced six hours a day, and we listened to recordings of all the great drummers as part of our normal family existence. As a result, rhythms are always moving in my body, and I have a special fondness for the drums as an instrument. Thanks so much for honoring such a gifted musician with your article. Thank you for sharing this post. 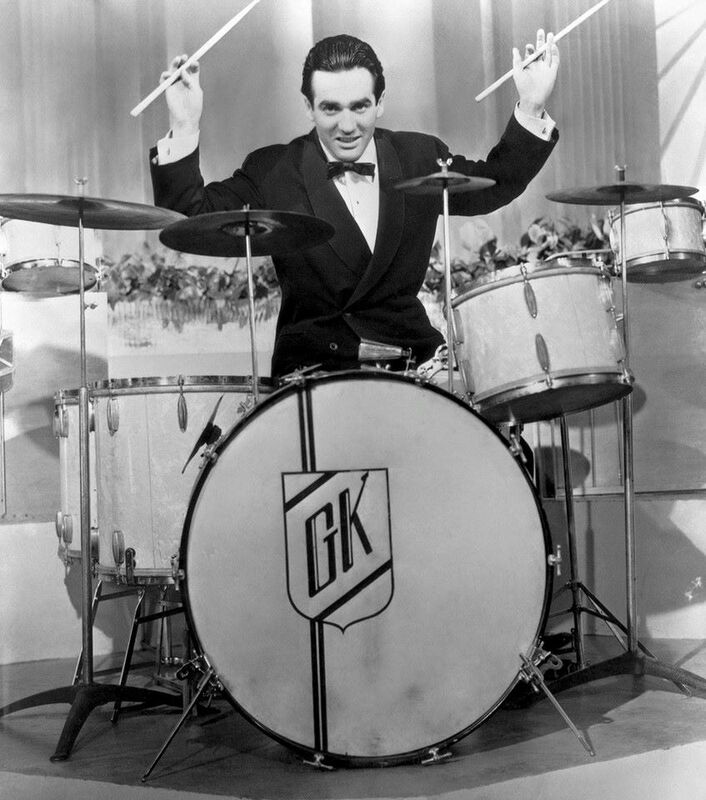 I had never heard of Gene Krupa before today.